I didn't follow the pattern exactly. The sleeves have an extra row. This was an "unplanned pattern change" but I decided to leave it. When I got to the wings, I liked how the ripple pattern looked. so I crocheted around a piece of wire when I did the top edge. and glued a pieace of ribbon around the bottom edge. took me a while to get to. I have since learned that the pattern can be found at Barbie Basics. 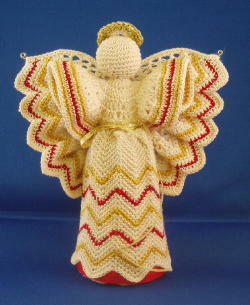 This pattern was designed for a 7 1/2" doll. 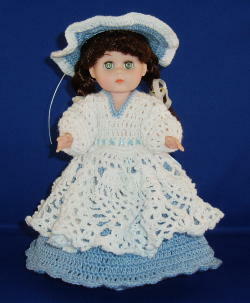 but I decided to use my 8" Ginny doll instead. As a child I played with Ginny, not Barbie. left over from my Grandmother's quilting materials. my mother gave all my dolls to a little girl in the neighborhood. I wished I had my dolls to give to her. On a trip to Solvang, I found a store selling Ginny dolls, newer ones, of course. So, rather than a 50 year-old Ginny, this is a 20 year-old Ginny.